Big solstice celebration at Stonehenge this morning: 'An estimated 20,000 people gathered at the stone circle in Wiltshire, in southwestern England. Dancers writhed to the sound of drums and whistles as floodlights colored the ancient pillars shades of pink and purple, and couples snuggled under plastic sheets.' The authorities now allow a time limited access for the gathering at this time of year, a long way short of the old free festival but a step forward compared with virtually no access at all except for paying customers in the 1990s. 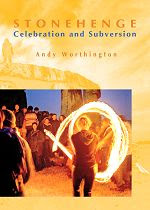 Andy Worthington's excellent book 'Stonehenge: Celebration and Subversion' is the counter-cultural history of people's efforts to gather there. The state's brutal crackdown on the Stonehenge Free Festival in the mid 1980s is covered in depth, culminating in the infamous 'Battle of the Beanfield' on 1 June 1985 when riot police battered and arrested 420 travellers in a field in Wiltshire. The various Druid groups celebrating there are also documented. Less familiar to me were the gatherings at Stonehenge earlier in the 20th century. A report from 1930 stated that 'Girls and boys danced by the lights of motor-cars which lined the road to the music of gramophones and a complete jazz band'. The following year 'Some erected portable tents by the roadside. Music was provided by several gramophones at various points outside of the enclosure and minstrels enlivened the vigil with mandolin selections'. He includes a great photo from the 1963 summer solstice of crowds including druids inside the stones with 20-odd sharply dressed mods looking down from the lintels.